I have started to track relationships with conditional tokens. This gives the mod the ability to unlock certain events depending on your status with the NPC. The statuses are Unknown, Acquaintance, Friend, Good Friend, Great Friend, Crush, Dating, and Married. Each status except Unknown will unlock certain events (which are in the works right now... some that I already made are going to be there but I am making more.) that yield certain amount of Friendship points. (250FP = 1 heart). I will be adding stronger probability but also ensuring that the events can only happen if the NPC is there unless certain situations deem otherwise. Please feel free to post opinions and comments by replying to this post. Tracking until full release :) This seems like it would be so much fun! This is such a cool mod! For the love of God please keep working on it okay? 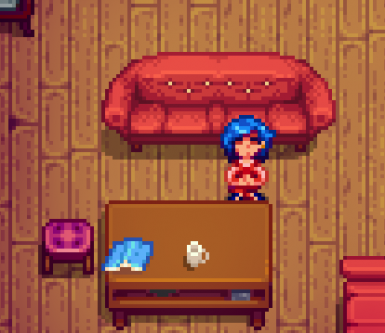 Its the one thing i feel missing so much in relationships with your friends or loved ones in stardew valley. Improving immersion in amazing way! I cant wait for more things to do with Penny. Hey Miss. I will make a translation of this mod to Portuguese-BR since it's my mother lang. It's weird to play on a language and then it suddenly changes to english. It would be better to have a translated version for this. If you want, I can PM you with the files once I'm done. If not, I will just keep the translation for myself. Great mod btw! Don't worry. Once I make it, it will be a matter of keeping it up-to-date. If I find it exhaustive to translate many lines of dialogue, I might ask for help with some other people from my country that also does translations. I'm just getting busy with stuff, but I'll try to send the translation to you ASAP. Absolutely love the idea! Installing this right now. Just a thought, but you may want to put a 'not rainy weather' check on the trigger conditions for a couple of events. In particular Penny's book reading and Haley's seashell hunt. If you have the time, you could implement an alternative reading event over in the library on rainy days or during winter. Edit: After not having Emily's meditation event occur, I went checking the mod data to see if there was another condition or time required. Is there a reason for it to require the player to be female for the event to play? Love the idea. I don't suppose dialogue mods would cause issues with this, right? No.. this does not adjust regular dialogue. That being said most of the events being made are based off of vanilla so if you have a dialogue mod that added something extra.. it won't know about it. I am trying to keep them general so it can fit though.. I uploaded a video of one of the events. I wonder if it's possible to paste the PC over the aerobics classe's assets somehow? That would make either joining the class or working out with Alex easier to make? Some to think since it's possible to get into the opposite locker room using a 'bug' it wouldn't be too exclusionary to include his routine their as well. Though he'd probably be a bit confused. Tough, I think if the PC told him they were sneaking over cause the girls side has no gym he might even get behind it. tl;dr I am a creature of random unsolicited brainstorming on other peoples project. I can go away if it bugs you? Or we could talk if you would like? If you don't answer at all, I may just keep leaving ideas here. Or I may get distracted by an errant butterfly and fall back in love with your idea in three years. It is really great. Never occurred to me & it is everything I never knew wanted. To do things like that I would have to make new graphics. I can, however, just fade out on that day and use messages to tell the story. So I can do something and I will hold this for a future update. This is a fantastic idea, I definitely look forward to the events you make for this.